TSPGECET 2015 Syllabus and TS PGECET 2015 Exam Pattern and Test Pattern is provided here below. Telangana State PGECET 2015 is going to be conducted by Osmania University on behalf on Telanga State Council of Higher Education (TSCHE) from 04.06.2015 to 08.06.2015. 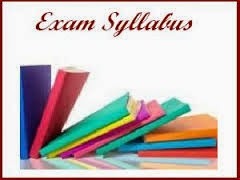 We are here providing the Test Syllabus and Test Pattern here below. Interested Candidates can go through the Telangana State PGECET syllabus 2015 and TS PGECET exam pattern 2015 in given below. The syllabus for this Telangana PGECET examination is based on Aerospace Engineering, Computer science and information technology, Instrumental engineering, Architecture & planning, Environmental Management and others as given below. TS PGECET 2015 Exam Pattern allows the aspirants to get an idea about the Examinations, Selection process will be based on writing objective type. This PGECET exam pattern 2015 consists of 120 marks. This question are in the form of Objective type and multiple choice type. Time duration for this AP PGECET exam 2015 is for 2 hours, and cut off marks in the test is 25% and there will be no marks in case of reserved section This exam is based on the English Languages. For more details go through AP PGECET notification 2015. TSPGECET-2015 examinations consist of each paper of 2 hours duration and carry a maximum of 120 marks. All the question papers of TSPGECET-2015 will be of objective type with multiple choice questions. Candidates have to mark the correct answer by darkening the appropriate bubble against each question on an Optical Mark Reader (OMR) with Black / Blue ink ball point pen only. OMR Answer Sheets will be supplied along with the Question Booklet.